You won’t hate Mondays anymore if you play at Casino.com! Their great promotion WILD MONDAYS gives you a chance to win some extra rewards! WILD MONDAYS – Make a deposit and get your free spins! Each Monday you can claim one of two free spins rewards depending on the amount you deposit. If you want to ensure you get the top amount of 70 free spins you can claim both offers every Monday. Make a deposit of $/£/€20+ or more using the bonus code MAJI. You will get 20 free spins on the Maji slot. Make a deposit of $/£/€50 or more using the bonus code LEGACY. You will get 50 free spins on the Legacy of the Wild slot. As soon as you make a qualifying deposit you will win your free spins. You will have 30 days after deposit to use them. All the winnings from the free spins you will be able to find at your account as bonus funds. You must wager them a minimum of 20 times before you can opt to withdraw your bonus or any winnings made from it. As soon as you’ve met the wagering requirements you will be able to withdraw a maximum of $/£/€100 winnings. Keep in mind that the winnings from the free spins will be credited to your account as bonus funds but can only be wagered on the game on which you received the free spins. 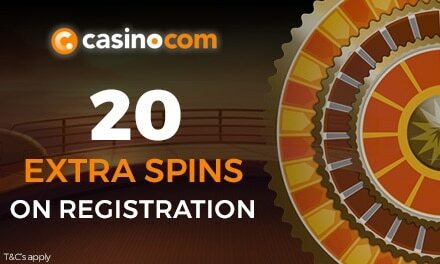 You can claim up to 70 free spins every Monday. Join Casino.com with us and get ready for a winning start to your week with Wild Mondays and plenty of spectacular rewards! Are you a casino fan? You would probably like to win 20 free spins and try out your luck. All you have to do is to join casino.com and play. No Deposit required to claim your free spins. Your free spins will be eligible to play on Age of Gods slot games only. That’s not all! If you join casino.com and make a deposit, there is plenty of that waiting for you! At last, make your first deposit at casino.com and they will double it. When you make your first deposit you will also receive an additional 180 free spins. Your 180 free spins will be released in increments of 20 per day over the next 8 days after making your first deposit. Use code RED for 50 spins on Age of the Gods: God of Storms – worth $0.25 a spin! Use code BLACK for 25 super spins on Jurassic Island – worth $0.50 a spin! At last, you can now earn yourself a reward simply by inviting your friends to play at your favorite casino. In addition too, for each friend who deposits and plays with us, we’ll thank you with a $50 bonus! Simply invite your friends by entering their email addresses in the cashier. And the best bit is – you can invite up to 20 people, so you could grab up to a whopping $1,000 in bonuses! Casino.com also has a loyalty program and many benefits that it brings. To see how it works, check out our site and full offer review.